THE TAKE HOME? If you’re fragile and your decisions on light hits your cells hard, you break because of poor free radicl signaling. If you’re properly connected to nature and life hits you hard, you withstand more and… eventually… you break because your mitochondria redox withers. But if you’re anti-fragile, your mitochondria become chronically and properly connected wirelessly to the sun and directly to the Earth surface and this makes you resilent and built to be far from equilibrium. We have a big problem in sports with players getting more CTE, ALS, and many other neurodegenerative diseases. Bob Mackey a Hall of Fame NFL TE died of front-temporal dementia. Why is that? Most people today have blamed chronic head injury for his outcome, but is it 100% accurate? Could some other stimulus have set the stage for this injury? The NFL’s use of RF and microwaves to communicate to player before and after and during the game is one of the major things putting all people in this environment at risk. It is not just the players at risk, it is everyone around the game who uses light freuquencies in ways we fail to realize who are also at risk. Mackey played when TV cameras used crude technology and TV had cathode rays tubes in them that released X-rays. People seem to forget this. When you add in the amount of tape they watch in the dark light during the daytime and consider all that blue light into their eyes day and night over 20 year careers it is no wonder that neurodegeneration is not more common in professional sports. I personnaly believe this is why CTE and concussions are epidemic proportions in football, hockey, and soccer. Altered frequencies of light lower the brain’s redox slowly over time and then a minor head trauma is capable of ruining the heteroplasmy rate within a brain and we get things like ALS, neurodegeneration, and CTE. No one sees these connections to an altered spectrum of light within the environment of sports. It grows everday. Blue light damages the retina in ways most do not realize. It damages the eye camera function but it is very bad for the eye clock function. These changes in the retina generalize to the SCN and leptin receptor via the central retinal pathways to cause the mitochondrial diseases of aging. Some of those eye diseases are macular degeneration, uveitis, uvela melanoma, retinal tears, and myopia. Those defects can lead to the soft tissue injuries in and arm and leg so common in baseball, basketball, football, hockey and soccer! In 2012, Duane Wade and Lebron James in 43 degree ice pool, they’re listening!! Now they need to get rid of those cell phones while helping their body. Today most NFL players are given ipads and laptops to learn their playbook. The actual old written playbook is gone from sports. It is preloaded now a blue lit device with a screen that has a color temperature of 5700K. If the player is wise, and modulates the blue light exposure using glasses or cooling they generally are using a software that induces the flicker effect. All sporting teams I have been around do most of their work under fluorescent light, LED light, or xenon light in their training facilities. Sporting and training used to be done under sunlight for the most part. As the TV contract money grew, training outside became less common. The use of technology has pulled players from nature and more indoors where man made light exists. 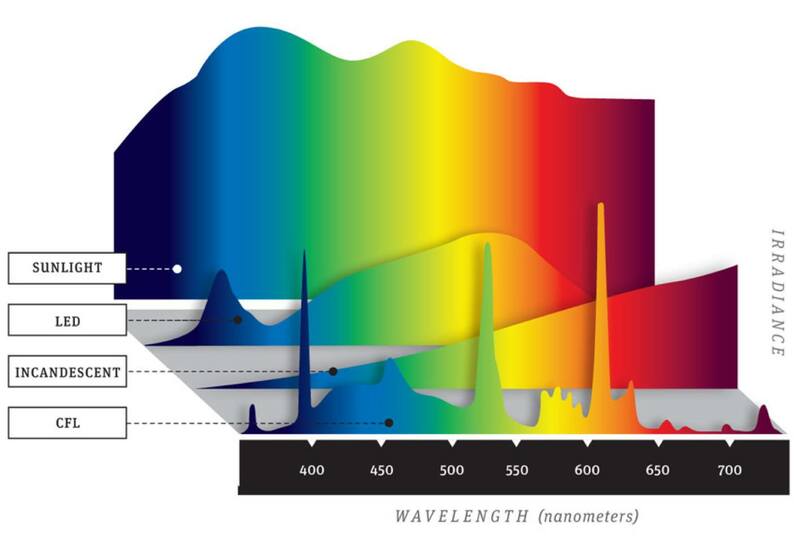 Look at this picture below and tell me is the spectrum of the all lights equivalent for the eyes or the brain? Why is it that players are getting more injuries in the muscle skeletal systems and why do they all have a pandemic of low sulfated Vitamin D3 levels in their players? Why is this happening? The professional teams physcians have no answers to this question. The incidence and prevalenace of injury is blatantly obvious to anyone who looks at the numbers. The answers are quantum and not going to be found on tests that modern physicians use to diagnose such injuries. If physicians and trainers thought about how a leaf works in a tree in photosynthesis to build organic mass they would immediately understand why when we hide human cells from solar light that organic mass in tissues is lost. Making a better football helmet is not the answer, in my opinion, but that has been the focus of NFL trainers. This mechanism misses the effects of spectrally deficiency in light that sets the stage for concussion and soft tissue damage due to mitochondrial damage over a career. And when you consider that some helmets (QB/MLB/S) are loaded with RF and microwave communication devices you can see the problem might be more magnified in some sports. Sports has subtracted out sunlight and added in the largest does of man made light while also using other forms of light to train, and run their teams under and no one sees the link. Sports should be played outside under sunlight. Rarely is that the case anymore. The training for all these sports used to be done outdoors too. Rarely is this done any longer. Why does the medical directors of teams who care for injured players see any changes in MRI’s and CT’s in their players who injure themselves? Could it be that the loss of light from the mitochondria in their neurons be invisible to them because of how they look for the problem? Maybe an MRI is not wise. Maybe a GDV camera, redox screening of mitochondria, or full body photomultipliers are more wise to screen for these injuries? Is this why ACL and achilles tears really happens? Players have been forced to wear shoes that disconnect them from earth because they are made of plastics and rubber. The surfaces have gone away from grass and moved to synthetic options. Why is that this is never spoken about in injury generation? Do they even know about the anti-inflamamtory effects of grounding? No, they chuckle at these things. They have no idea what they are missing. The cost of soft tissue injuries in 2014 for the NFL related to light reveals a geographic and population density skew as a quantum biologist would expect. 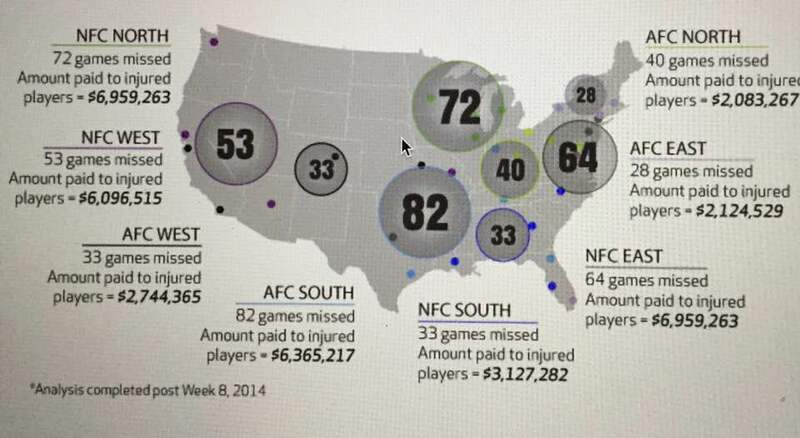 Look at the US map below for 2014 NFL injuries below. Through the first half of the 2014 NFL season, the rash of injuries affecting players (especially high profile players) was at an extremely high level. As week 8 came to a close, physicians and trainers examined the public injury reports for incidence of soft tissue injuries and their impact on both games missed and “lost” salaries paid to injured players. Through careful analysis it was discovered that a staggering 405 total games were missed by players suffering from soft tissue injuries. Furthermore, these 405 games have cost NFL teams over $35 million in salaries paid to players unable to participate in games through the first half of the 2014 season. Not mention how these injuries translated to a lowered redox potential of these athletes which correlates with future injury risk and a shortened earning career. We are two weeks away from the 2017 NFL draft and the top rated cornerback from Ohio State University, Marshon Lattimore has missed close to two years in college due to severe hamstring issues. Mr. Lattimore is from Cleveland, Ohio. Cleveland has a latitude of 41.5 degree North. OSU is in Columbus, Ohio which is at a 39.96 degree latitude North. He has to have several surgeries to deal with this issue early in his college career. Mr. Lattimore is African american and has darker skin which means he needs more sunlight on these muscles to avoid injury. This is very difficult to do at a 41.5 degree North latitude. If the NFL GM’s understood these risks they’d understand why it might not be wise to draft Lattimore in the top ten of the draft and put him right back indoors two weeks after the draft to get him ready for the NFL game. GM’s of northern latitude teams would be wise to move him down on their boards because of these redox potential risks. Teams in the southeast would be more wise to consider him if they knew that his hamstrings need that sunlight to reduce his injury risk. If he goes to a team above Jackson, Mississippi’s latitude I will make a prediction: He is very likely to have problems with other muscles, ACL’s, concussions, and his achilles tendons. Cornerbacks make their living with the legs. When Mr. Lattimore went to the NFL combine in February of 2017 in Indianoplis it was held in an indoor stadium under man made light. When he ran his forty yard dash he pulled up lame with another hip flexor muscle injury. Do you think this was a coincidence or might it have been tied to him being dehydrated by the indoor light in the RCA dome and the hospitals he was forced to be examined under for two days before he ran his forty given his history? Let’s take it forward: Might he be higher risk for concussion and neurodegeneration if this chroic dehydration and lack of solar exposure continues during his career as an NFL cornerback? Can the medical teams of professional teams continue to be ignorant of the effect of sunlight on muscle injuries. None of them seem to have a clue why these injuries are exploding. You’d think they’d understand these risks and when you consider he played at a high latitude college, anyone drafting him should be in the Southeast or in Southern California where the sun is stronger. Some of you might think these links I am making are hard to fathom. Look at the NFL top 20 NFL rushers in history. Running backs, like corner backs make their living by running. They need to have good hamstring’s and good muscle fiber types tied to their level of dopamine which is made by the interaction of sunlight and aromatic amino acids in their body. You’ll note something unusual when you look at the NFL’s career leading rushers. 19 of the 20 come from the deep south where the sunlight is strongest in the USA. The leading NFL rusher is Emmitt Smith and he comes from Pensacola, Fla. Let’s look back at the 2014 season. Through deeper analysis of the 2014 NFL it was easily determined that hamstring strains were the most frequent contributor causing 167 missed games. This is big news for a team looking to draft a CB high in two weeks. Another CB tore his achilles tendon in his proday workout for teams at the University of Washington (Sidney Jones). This epidemic is beginning in college too. No one is making the connections to altered light frequencies either. African americans have a higher risk of these injuries because their skin requires more solar exposure and not less. Lattimore and Jones are both African American and went to school at northern latitudes. In 2014, in the NFL groin strains were a distant second, resulting in 67 games missed. The illustration below shows this data divided by division and by latitude. It does not take into account where the players were from or what their injury history or redox potential was during their careers. This information is likley very important in making sense of the numbers. The key is the number of injuries is explosive compared to the 1960’s, 70’s, and 80’s. At this rate, roster expansion will have to occur soon to offset the injury risk. 1. In the NFL – 70% of recent ACL injuries are non-contact injuries. Teddy Bridgewater is best example. 3. Specialization has resulted in an increase of overuse injuries, burnout and dropout rates have skyrocketed. 4. Dehydration impacts decision making and reaction time because they correlate with low vitamin D3 levels. 5. Athletes who experience 2 injuries that cause missed time in a single season have a 40% higher dropout rate than athletes who experience one or none. The use of very low frequency light for communications in professional sports is now at epidemic levels. Could this be why these players get injured more frequently today? We know that low frequency light radiations cause intracellular dehydration and are associated with low sulfated Vitamin D3 levels. We also know this lowers their redox potential and the method of training of most modern athletes is now follows an indoor path where man made light dominates over solar exposure. We also know that modern athletes stopped using leather soled shoes in the 1970’s in most sports. Their legs and feet are now insolated from the Earth magnetic flux. They never make us of grounding. Foot, ankle and achilles tears are exploding in all sports. In fact, the NFL has a physician in North Carolina where they send their players too to get repaired. The surgery is done but nobody in North Carolina can explain why these injuries are more common in 2017 than they were in 1969. The reason is simple: they do not understand how light works in biology. The darker or more tatoo’d the athlete’s skin is, the more the redox potential is lowered because of a disconnection from the wireless connection to the sun. Could this be why so many sports figures come down with ALS after sustaining many smaller insults to their redox potential over a career? Does the type of incident light radiation lead to free radical generations than can cause human motor neuron disease? These professional athletes are just some who came down with ALS: Lou Gehrig, Steve Gleason, Tim Shaw, Dwight Clark, Ezzard Charles, Marián Čišovský, Jeff Capell, Sid Collins, Neale Daniher, Bruce Edwards, Jim Catfish Hunter, Jimmy Johnstone, Glenn Montgomery, Don Revie, Fernando Ricksen, Kevin Turner, Gianluca Signorini, Ed Sadkowski. Many other professions use low frequency light for communications too. This affects the surfaces of their cells and what free radicals a mitocondria can make. We need to realize the use of low frequency communications is akin to using light out of its normal spectrum here on Earth. We just do not get it. Anytime man subtracts frequencies in sun light for illumination or for communication it leads to up-regulation of the AMPk pathways and glucose metabolism. This is what Otto Warburg warned us about in the 1920’s. This was re-done in modern labs of Nora Volkow and Allen Frey. Their experimental work confirmed these effects many times over. How does it happen? Look at the picture below carefully. Why is it that collegate and pro-clubs avoid professionals who understand and know about these links to light and free radical formation? Might it hurt the bottom line? How many more times do we have to be told this information before we change how we do business???? Cell metabolism is dependent on light that a cell senses, and the light environment can lead to an abnormal acoustic response of mitochondria. We know today that man, essentially, is a being of light. And the modern science of photobiology is presently proving this. In terms of healing the implications are immense. We now know, for example, that quanta of light can initiate, or arrest, cascade-like reactions in the cells, and that genetic cellular damage can be virtually repaired, within hours, by faint beams of light. We are still on the threshold of fully understanding the complex relationship between light and life. Professional sports is light years away from these relationships but their players are falling apart on the field and their careers are being shortened and their health span is under attack and no one wants to talk about why? I do not get that. The NFL also knows that there is a competition issue that is linked to circadian disruption of eastward travel. This helps West coast teams. Las Vegas has taken huge advantage of this for years in how they build their point spreads. It is well known. Within any important issue, there are always aspects no one wishes to discuss. I think professional sports teams will want to run away from this discussion. Colleges sports programs need to understand the risks their atheletes are under because of the way sports teams train and prepare for competition. Controversy helps us see how people really think and this allows us to pick our tribe, participation, and the sports we choose to play. In times of chaos, people revert to their mean and their truth is exposed. The recent concussion litigation was settled in the NFL but we are begiining to see legal cracks in that settlement as neurodegeneration and injuries continue to explode in professional sports. We need to spend our time and share with those who think coherently about an issue. The law of the universe is simple. Every experience is repeated or suffered until you experience it properly and fully the first time yourself. In nature we never see anything isolated (light frequencies); everything is woven and connection with something that would surprise us. This is why the foundations of nature confound man. We do not weave the web of life, we are merely a wisp in it. Whatever we do to the web, we do to ourselves. For those who don’t see this, I eliminate them from my world quickly. Maybe its time for athletes to begin to think differently about what experts they hire and listen too? Maybe they re-consider how and where they train their minds and bodies to prepare for competition because it is clear professional and collegiate organizations are recalcitrant to do so because of business and profit. This blog is also not good news for those who own indoor gyms and are trying to help people improve. They actually maybe making the redox potential of their clients worse.